Kate Christensen is the author of five previous novels, including In the Drink, Jeremy Thrane, The Epicure’s Lament, and Trouble. The Great Man won the 2008 PEN/Faulkner Award. She has written reviews and essays for numerous publications, most recently the New York Times Book Review, Bookforum, Tin House, and Elle. Harry Quirk’s obsession with his imploding marriage forms a central arc in The Astral. Do you trust his narrative of the marriage and its dissolution? How does your opinion of him evolve as you read the novel? Luz is convinced that Harry is sleeping with Marion. Although her accusations of sexual intimacy are unfounded, Harry and Marion are very close friends. Do you think that it is possible to commit emotional infidelity, and if so, is Harry guilty of it? How would you define an “emotional affair”? In Chapter Fourteen, Harry visits his wife’s therapist, Helen. What do you make of Harry’s animosity towards her? Why do you think the author included this confrontation? Harry’s work-in-progress, “an epic poem of loss and displacement,” is titled The Astral. How does this echo the symbolic role of The Astral apartment building in the novel? During the course of the novel, Harry and Karina pay several visits to Hector at the Sag Harbor compound. How do these experiences compare, and what do they contribute to our understanding of Hector and his situation? Do you think Hector is a true believer of the Children of Hashem cult, or is he an opportunist like his older consort Christa? 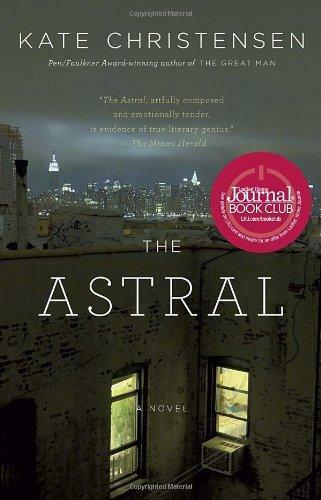 The Astral portrays a multi-racial, multi-ethnic, rapidly changing Brooklyn of artists, artisans, immigrants, and long-settled locals. Discuss the tensions inherent in such a quilt of social types. How does the author portray the interactions between immigration and gentrification? Kate Christensen once wrote an influential essay titled “Loser Lit” in praise of such books as Lucky Jim, A Confederacy of Dunces, Jernigan and Wonder Boys, whose books center on self-defeating characters whose often comic misadventures as they slide to the bottom have garnered these novels fervent cult followings. To what extent do you think Harry Quirk qualifies as a Loser Lit antihero? Read “The Irony of Perspective, a Book Club Discussion” by Reading Group Choices' Neely Kennedy for discussible topics and themes!